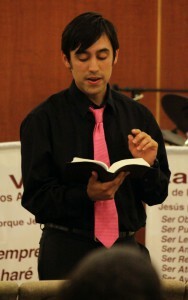 Student pastor Arturo Quintero delivers the message The Body of Christ to his congregation. Student pastoring is a program at Southwestern Adventist University that gives theology majors a firsthand experience in the duties of a senior pastor. Currently I am enrolled in the student pastoring program and can testify that it’s a very useful experience. The program presents you with real-life experiences that can’t be taught in a classroom setting. There are specific guidelines that the student and pastor have to follow to assure a good learning experience. These guidelines include: preaching, pastoral visitation, board meeting attendance, and preparing candidates for baptism. I believe that this program really allows the student to evaluate their life and career choices. Also, this program really challenges a person to question whether being a pastor is really for him or her. While it is very hard work, it’s also very rewarding because a student can start developing his or her own philosophy of ministry. Not only does the student pastoring program provide valuable on-the-job experience, it also gives you something economic. The program includes some money to pay for any expenses employed doing the jobs in the church. The student pastoring program has really helped me dive deeply into things that I had not seen before. While I have been active in the church before, this time I have the ability to see things through the eyes of a pastor. The program also helps as a base to build on for the School of Evangelism. The plan is to work in the churches to develop candidates for baptism so that they can be ready for the conferences that we are going to give with the School of Evangelism. This experience is going to be greatly rewarding and will confirm to the students if they are right for pastoral ministry. If you are struggling with the question on whether you are called to ministry, I can mostly assure you that the time spent in the program will answer that question. The Southwestern Brass Ensemble played, the professors, administrators and board members entered in traditional robes, and Southwestern Adventist University’s annual Convocation Service marked the official beginning of another school year.